It’s a bit Portlandia-pretentious, a bit yuppie-hipster-couple embarrassing, but I’m just going to say it. I love farmers markets. Saturday mornings were once a time of the week spent exclusively hungover and in search of bacon. Now Saturdays are a time of baskets and cloth bags, tasting artisanal cheeses, considering baguettes and boules, hunting for the cheapest heirloom tomatoes, and picking over piles of fruit for the least blemished. I invariably spend way more money than I intended and arrive home with a motley assortment of produce I don’t quite know what to do with, battered by being ferried home in a bike basket. Market aficionados are spoiled for choice in New York – Union Square is the ultimate, but I’ve heard others swear by Chinatown, McCarren Park and Smorgasburg in East River Park in Williamsburg. My local is Grand Army Plaza at the edge of Prospect Park in Brooklyn. It’s a quick bike ride from home, and you can always while away a few hours in the park eating your market goodies and pretending to read a book while secretly perving on other people’s dogs. This Saturday I was missing my regular market-going, dog-creeping partner in crime, and was in need of distraction. I parked my bike, returned some DVDs to the library and joined the hustle at the markets. It was my most random bounty yet: a bunch of beets, little rainbow tomatoes, poblanos, jalapenos, Serrano chiles, a bunch of arugula (rocket! ), a couple peaches, a very pretty baby eggplant, a long baguette and a bunch of snapdragons. 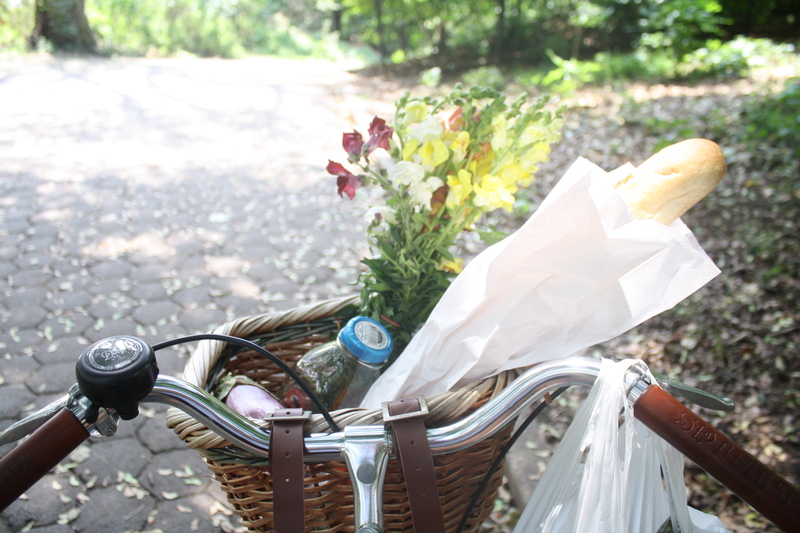 Arranged it all artfully in my bike basket and began the ride home through the park feeling like the exact image of the girl I always wanted to grow up to be – the kind who breezes through summer days on a bicycle with a basket full of flowers and a French loaf. Felt very smug and proud of myself, beaming at passersby and pointing children. But pride comes before a fall… and so do potholes. A few blocks from home I hit a bump and half the contents of my basket bounced out onto the road. Let’s just say I never wanted to grow up to be the kind of girl who unleashes a torrent of swear words in front of a trio of chinese nannas while scooping up snapdragons from the gutter. But we dusted ourselves off, and the snapdragons are still going in a vase on the kitchen table. The irony of farmers markets is that city-dwellers are often far better served with regular markets – and the health and hip-pocket benefits that come with local, seasonal produce – than the regional and remote areas that might even grow said produce. Every time I buy a cheap punnet of blueberries here, I think of my dad back in St George forking out about $9 for the equivalent. Admittedly there are higher transportation costs to remote areas, and ordering for a smaller population must have its difficulties. But when it’s cheaper to buy a preservative-laden pre-packaged meal from the supermarket or something from the hot box at the servo, than fresh vegetables and fruit, we can’t keep feigning confusion about rising obesity levels. Let’s hope this movement toward sustainable seasonal eating flows on to our friends outside the cities.